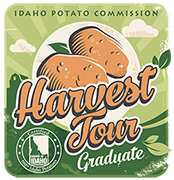 You’re thinking Idaho, right? Or Ireland? Neither one! Like the tomato, the potato, too, is originally from the Andean region of South America, where more than 5,000 varieties are cultivated! 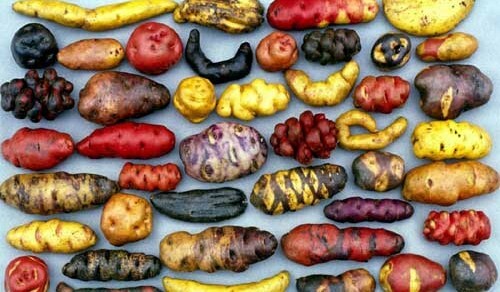 A Peruvian farmer’s market may sell up to 30 varieties of spuds ranging in color and shape from purple, orange, spotted, banana-like, and a few that, literally, look like hand grenades. The Latin American term, ‘papa’, comes from Quechua, the language of the Incas. Spaniards, however, use “patata” whose root (no pun intended), ‘batata,’ comes from the Caribbean’s indigenous language, Taíno, and technically refers to the sweet potato. This vegetable root was freeze-dried and stored by pre-Incan and Incan societies, a product they called in Quechua, chuñu, allowing them to have a stable food supply during low-yielding harvests. In fact, it was in the form of chuñu that the Spaniards first learned about the potato when they observed Andean miners eating it. Little did the gold-hungry Spanish know that instead of the mythical paradise of El Dorado, they would eventually find a treasure trove of golden orbs produced in the belly of the Earth! The potato was soon scrutinized by the monarchy’s ‘food inspectors’, and, again, like the tomato, this food was initially rejected by Spaniards and later the rest of Europe. Whereas the tomato was “too red” and associated with sin-producing passions, this poor fellow was “too dirty” and therefore associated with poverty, poor hygiene, and urban filth. The spud was even rejected by the superstitious under-classes, an interesting fact since the potato, one of the easiest and versatile crops to cultivate, would eventually save the poorer sectors of society in Ireland, France and Russia from famine caused by wars, economic instabilities, and harsh weather conditions. Religious zealots also rejected it since it wasn’t mentioned in the Bible. The potato, it can be argued, is one of the most ‘democratic’ and ‘honorable’ of crops, “an enemy of hunger,” as the poet of the American continent, Pablo Neruda, referred to it. Isn’t it amazing, dear reader, that such a simple root was perceived in one historical era as a dirty earth tumor and in another era be praised and adored in the form of French fries, vodka martinis, and potato chips? So next time someone places an odd food on your plate, don’t be so hasty to reject it! Don’t ever yuk someone else’s yum! The economy and your access to solid nutrition may one day depend on it! The next morsel of food history…. the delectable avocado! I really enjoyed this little bit of info. It is now November 2016 and I’m just now seeing this. I subscribe to Rodale’s Organic Gardening magazine and the last issue featured this very topic of Peruvian potatos. I was enthralled by the number of different varieties grown and by the fact that the Peruvian farmers actually cultivate cross breeding! I am very excited to see the growing number of different potatos you can now buy at the supermarket, not to mention the varieties you can get from a CSA box or farmers market. I haven’t bought a boring Big Agra russet in years. Thank you for your efforts to educate us folks!